Karwick is a wizard adventurer. Karwick was born and raised in a small village in Rindland. His family were oxen herders. Karwick was always a little brighter than the other kids. He never fit in. While smart, he wasn't a bean pole, he was a scrapper; rough and tumble. He loved books and would sneak book away from local peddlers. He became self taught in history and academics. One day, he stole a book from a traveling wizard. Karwick is entirely self trained. He decided to do bigger things. He was not going to marry Olga from the next farm over. He packed up and left to see what happens. He didn't get far from his village when he was attacked by worgs. 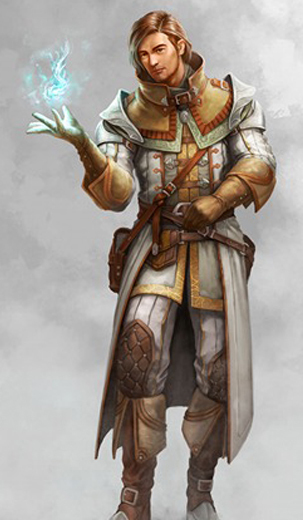 However, he was saved by the elf, Aeron Jun Brynmor. They became good friends afterward and decided to travel to Freeburg to investigate a white apple. Nocturn is Karwick's vampire bat familiar. When attending Archlan University, he cast a Find Familiar spell for a fey spirit that took the form of a fruit bat, but Nocturn appeared as a vampire bat instead. This lead his professor, Betlindis Ule to ask if he had any exposure to negative energy, which he denied. Nocturn is a purple furred vampire bat with a strong personality. She and Meepo have an antagonistic relationship.